Blues rock started with rock musicians in the United Kingdom and the United States performing American blues songs. They typically recreated electric Chicago-style blues songs, such as those by Muddy Waters, Jimmy Reed, Howlin' Wolf, and Albert King, at faster tempos and with a more aggressive sound common to rock. In the UK, the style was popularized by groups such as the Rolling Stones, the Yardbirds, and the Animals, who managed to place blues songs into the pop charts. In the US, Lonnie Mack, the Paul Butterfield Blues Band, and Canned Heat were among the earliest exponents and "attempted to play long, involved improvisations which were commonplace on jazz records". John Mayall & the Bluesbreakers and Peter Green's Fleetwood Mac also developed this more instrumental, but traditional-based style in the UK, while late 1960s and early 1970s groups, including Ten Years After, Savoy Brown, the Climax Blues Band and Foghat became more hard rock oriented. In the US, Johnny Winter, the Allman Brothers Band, and ZZ Top represented a hard rock trend. Along with hard rock, blues rock songs became the core of the music played on album-oriented rock radio, and later the classic rock format birthed in the 1980s. Although around this time, the differences between blues rock and hard rock lessened, there was also a return to more blues-influenced styles. In the 1980s, the Fabulous Thunderbirds and Stevie Ray Vaughan, recorded their best-known works and the 1990s saw guitarists Gary Moore, Jeff Healey, and Kenny Wayne Shepherd become popular concert attractions. Groups such as the Jon Spencer Blues Explosion and the White Stripes, brought an edgier, more diverse style into the 2000s, as do contemporary artists such as the Black Keys. The electric guitar is usually amplified through a tube guitar amplifier or using an overdrive effect. Two guitars are commonplace in blues rock bands: one guitarist focused on rhythm guitar, playing riffs and chords as accompaniment; and the other focused on lead guitar, playing melodic lines and solos. Blues rock pieces often follow typical blues structures, such as twelve-bar blues, sixteen-bar blues, etc. They also use the I-IV-V progression, though there are exceptions, some pieces having a "B" section, while others remain on the I. The Allman Brothers Band's version of "Stormy Monday", which uses chord substitutions based on Bobby "Blue" Bland's 1961 rendition, adds a solo section where "the rhythm shifts effortlessly into an uptempo 6/8-time jazz feel". The key is usually major, but can also be minor, such as in "Black Magic Woman". Rock and blues have historically always been closely linked, with driving rhythms and electric guitar techniques such as distortion and power chords already used by 1950s blues guitarists, particularly Memphis bluesmen such as Joe Hill Louis, Willie Johnson and Pat Hare. Characteristics that blues rock adopted from electric blues include its dense texture, basic blues band instrumentation, rough declamatory vocal style, heavy guitar riffs, string-bending blues-scale guitar solos, strong beat, thick riff-laden texture, and posturing performances. Precursors to blues rock included the Chicago blues musicians Elmore James, Albert King, and Freddie King, who began incorporating rock and roll elements into their blues music during the late 1950s to early 1960s. In 1963, American rockabilly soloist Lonnie Mack had an idiosyncratic, fast-paced electric blues guitar style that later came to be identified with blues rock. His instrumentals from that period were recognizable as blues or R&B tunes, but he relied heavily upon fast-picking techniques derived from traditional American country and bluegrass genres. The best-known of these are the 1963 hit singles "Memphis" (Billboard R&B #4, Pop #5) and "Wham!" (Billboard Pop #24). However, blues rock was not named as such, or widely recognized as a distinct movement within rock, until the mid-late 1960s. At that point, Mack's earlier recordings were rediscovered and he came to be regarded as a pioneer, or close stylistic forerunner, of what, by then, had become known as "blues rock guitar". Other American artists, such as Paul Butterfield and Canned Heat are now also considered blues rock pioneers. In the UK, several musicians honed their skills in a handful of British blues bands, primarily those of Cyril Davies and Alexis Korner. While the early British rhythm and blues groups, such as the Rolling Stones, the Yardbirds, and the Animals, incorporated American R&B, rock and roll, and pop, John Mayall took a more distinctly electric blues approach. In 1966, he released Blues Breakers with Eric Clapton, the first of several influential blues rock albums. When Eric Clapton left Mayall to form Cream, they created a hybrid style with blues, rock, and jazz improvisation, which was the most innovative to date. British band Fleetwood Mac initially played traditionally-oriented electric blues, but soon evolved. Their guitarist Peter Green, who was Clapton's replacement with Mayall, brought many innovations to their music. The electric guitar playing of Jimi Hendrix (a veteran of many American rhythm and blues and soul groups from the early-mid-1960s) and his power trios, the Jimi Hendrix Experience and Band of Gypsys, had a broad and lasting influence on the development of blues rock, especially for guitarists. 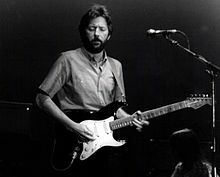 Clapton continued to explore several musical styles and contributed to bringing blues rock into the mainstream. By this time, American acts such as the Doors and Janis Joplin further introduced rock audiences to the genre. David Gilmour of Pink Floyd is known for incorporating a mixture of blues rock, progressive rock and psychedelic rock into his guitar work. Gilmour has described Hendrix as an inspiration for his style of playing. In the late 1960s, Jeff Beck, with his band the Jeff Beck Group, developed blues rock into a form of heavy rock. Jimmy Page, who replaced Beck in the Yardbirds, followed suit with Led Zeppelin and became a major force in the 1970s heavy metal scene. Other blues rock musicians on the scene in the 1970s include Dr. Feelgood, Rory Gallagher and Robin Trower. Blues rock had a rebirth in the early 1990s–2000s, with many artists such as Gary Moore, Mad Season, John Norum, Gary Clark Jr., Susan Tedeschi, the White Stripes, Jack White, Rival Sons, John Mayer, Blues Traveler, the Black Crowes, the Black Keys, Jeff Healey, Philip Sayce, Clutch, the Jon Spencer Blues Explosion Joe Bonamassa, Greta Van Fleet, and Guy Forsyth. ^ Weinstein, Deena. Heavy Metal: The Music and its Culture. DaCapo, 2000. ISBN 0-306-80970-2, pg. 14. ^ Christe, Ian. Sound of the Beast. Allison & Busby. p. 1. ISBN 0-7490-8351-4. ^ a b c d "Blues-Rock". AllMusic. Retrieved May 10, 2015. ^ Pareles, Jon (June 18, 1986). "Oldies on Rise in Album-Rock Radio". The New York Times. Retrieved April 19, 2019. ^ Poe, Randy (2006). Skydog: The Duane Allman Story. Backbeat Books. ISBN 978-0879308919. ^ Covach, John (1997). Understanding Rock: Essays in Musical Analysis. Oxford University Press. pp. 63–71. ISBN 978-0-19510-0051. ^ Dicaire, David (1999). Blues Singers: Elmore James entry. McFarland. Retrieved 2013-06-02. ^ Guterman, The Best Rock 'N' Roll Records of All Time, 1992, Citadel Publishing, p. 34. ^ P. Prown, H. P. Newquist, J. F. Eiche, Legends of rock guitar: the essential reference of rock's greatest guitarists (Hal Leonard, 1997), p. 25. ^ a b c d e f g V. Bogdanov, C. Woodstra, S. T. Erlewine, editors, All Music Guide to the Blues (Backbeat, 3rd edition, 2003), pp. 700-2. ^ Adelt, Ulrich, Blues Music in the Sixties: A Story in Black and White. (Rutgers University Press, 2011), ISBN 0813551749, pp. 72-73. ^ P. Prown, H. P. Newquist and Jon F. Eiche, Legends of rock guitar: the essential reference of rock's greatest guitarists (Hal Leonard Corporation, 1997), p. 113. ^ Bogdanov, C. Woodstra, S. T. Erlewine, All Music Guide to the Blues (Backbeat Books, 3rd edition., 2003), p. 600. ^ P. Buckley, The Rough Guide to Rock (Rough Guides, 3rd edition., 2003), p. 99. ^ A. Petrusicht, Still Moves: Lost Songs, Lost Highways, and the Search for the Next American Music (Macmillan, 2008), p. 87. ^ A. B. Govenar, Texas Blues: The Rise of a Contemporary Sound (Texas A&M University Press, 2008), p. 90. ^ "Clutch", Allmusic, retrieved 21/08/09. ^ S. Taylor, A to X of Alternative Music (Continuum, 2006), p. 242. ^ "Joe Bonamassa", AllMusic, retrieved 21/08/09. ^ Richard Skelly. "Guy Forsyth | Biography". AllMusic. Retrieved 2014-03-14.